Luke Rockhold is one of the best grapplers in UFC Middleweight division. He is a former three-time Strikeforce champion and a former UFC Middleweight Champion. Luke Rockhold is currently 34 years old according to his/her date of birth October 17, 1984. Luke Rockhold is one of the rare UFC fighters who doesn’t have a nickname. Rockhold has great kicks, especially left diagonal kick to the body and left high kick. He is a southpaw fighter with solid punches. However, Luke’s specialties are grappling, ground and pound game, and various submissions. As a black belt in BJJ, Luke Rockhold was able to submit some of the best names in the world of UFC. His favorite submission is rear naked choke (5 victories). He also has one victory via kimura, inverted triangle kimura, armbar, and guillotine choke. Luke also has 4 knockout victories. Luke Rockhold had his MMA debut on July 24, 2007, in MotM: Melee Of The Mountain event, against Mike Martinez, and won via armbar in the first round. Rockhold had a score of 10-1 before joining UFC. He won some notable names like Ronaldo Souza, Keith Jardine, and Tim Kennedy in the Strikeforce Title Fights. The longest fights of his career were Strikeforce finals versus Souza and Kennedy, which Luke won via unanimous decision after five rounds. He submitted Cory Devela after 0:30 in the first round, which is his fastest victory. Luke Rockhold has his UFC debut against Vitor Belfort at UFC On FX 8 on May 18, 2013, in Jaragua do Sul, Brazil. In the first round, Belfort delivered a spinning heel kick to the head and started landing punches on the ground. Vitor Belfort won via TKO. Luke had his first UFC victory against Costas Philippou at UFC Fight Night 35 on January 15, 2014. 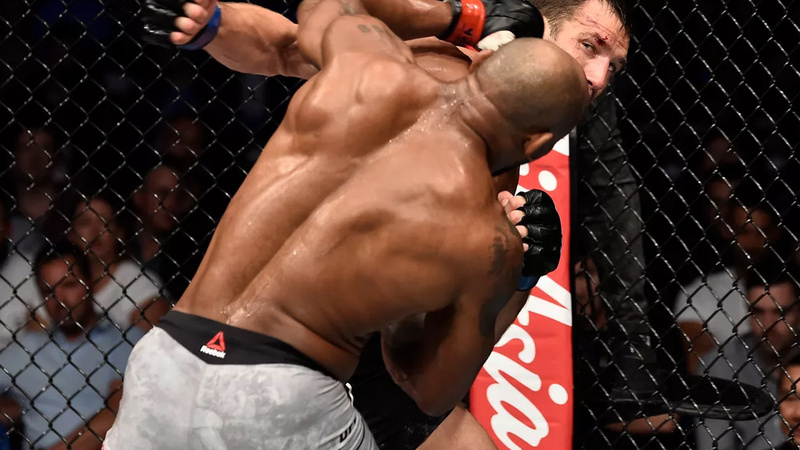 In his second main event of the evening, Rockhold won via stunning body kick in the first round, earning his first Knockout Of The Night award. His next opponent was Tim Boetsch at UFC 172 on April 26, 2014. Rockhold was a winner again in the first round via inverted triangle kimura. In the third main event of the evening, he faced the biggest British trash-talker, Michael Bisping. The two fought at UFC Fight Night 55, on November 8, 2014, in Sydney, Australia. Luke Rockhold won the match via guillotine choke, earning his first Performance Of The Night award. Lyoto Machida was his opponent at UFC On Fox 15, on April 18, 2015. 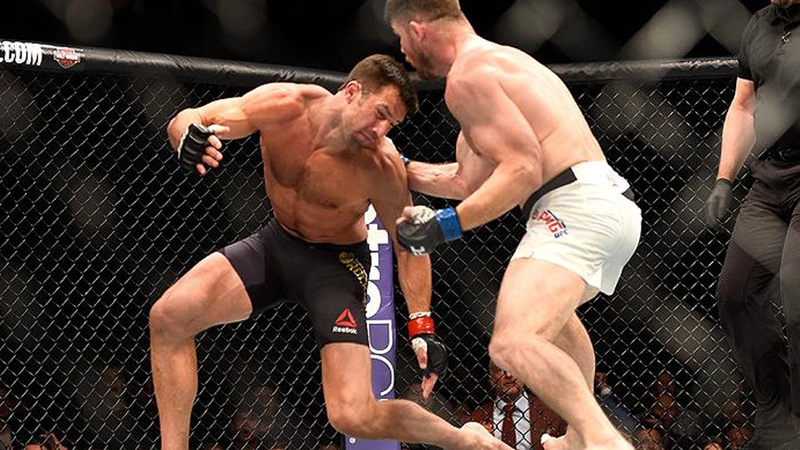 Despite being an underdog, Rockhold surprised the UFC world. In a one-sided fight, Luke won via rear-naked choke in the second round. This was his fourth main event of the evening and second Performance Of The Night award. 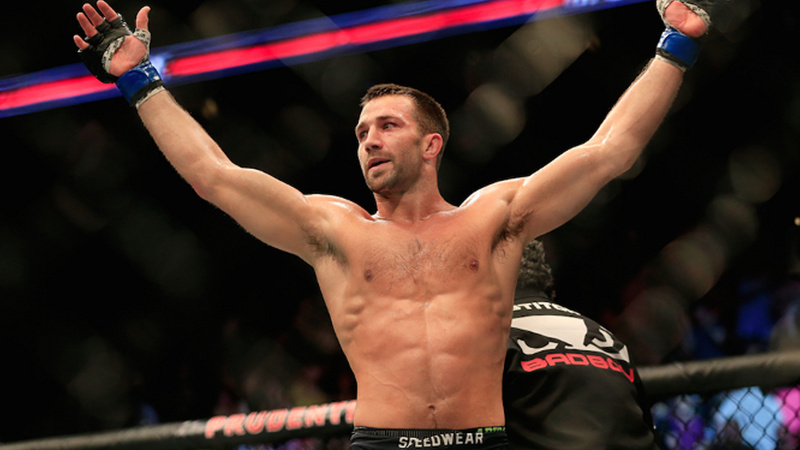 In the co-main event of the evening, Rockhold faced Chris Weidman on December 12, 2015, in Las Vegas, Nevada. Rockhold maintained the control of the first round via kicks, not letting The All-American get close. He defended Weidman’s early takedown attempt successfully and returned to stand-up. In the third round, Weidman missed wheel kick and Rockhold got on top of him. He landed many brutal ground and pound punches, but Chris Weidman survived the round. Luke Rockhold continued doing the same thing in the fourth round and won via TKO in the fourth round. It was his first Fight Of The Night. After a heavy word exchange prior to the fight and Bisping’s threats, everybody was expecting a tough fight. But looks like Michael Bisping was a too tough rival for Luke Rockhold in their rematch on June 4, 2016, in Inglewood, California. It was the main event of the evening. Rockhold was knocked down by the left hook in the first round, and he stood up quickly, but Michael Bisping connected with another left hook and rocked him again. Luke Rockhold was on the fence, and Bisping started raining punches. The referee stopped the fight, and Bisping won via KO in the first round. The two continued their heavy word exchange in the post-fight press conference. Rockhold fought David Branch at UFC Fight Night 116 on September 16, 2017, in the sixth main event of the evening. Luke won the fight via submission, after forcing Branch to tap out after a brutal barrage of ground and pound punches. His next opponent was Yoel Romero on February 11, 2018. The Soldier of God missed weight (he had 187.7 pounds) and became ineligible for the title. Romero was fined, and 30% of his outcomes was given to Rockhold. The fight was very slow and boring for the first two rounds. In the third round, Romero knocked Rockhold out with a stunning left hand. After the match, Romero kissed Rockhold’s head several times. There are two possibilities – Michael Bisping trilogy or Alexander Gustafsson fight. After Rockhold’s statement that he would seriously torture his body staying Middleweight, who knows. But one thing is certain – if he goes Middleweight, he won’t be one of the tallest fighters in the division anymore. Luke Rockhold is a model, and he modeled at the New York Fashion Week. He is also an avid surfer and skateboarder. He dated a famous actress and singer Demi Lovato at the end of 2016, but the couple split up.